Downing Street's director of political operations has been questioned for a second time by police investigating allegations of cash-for-honours. John McTernan, seconded to the Scottish Labour Party to run its campaign for May's Holyrood elections, was re-interviewed under caution last week. 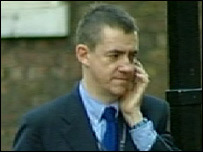 The interview took place before Ruth Turner, the prime minister's director of government relations, was arrested. Police have so far spoken to about 90 people including Tony Blair. Metropolitan Police officers, headed by Assistant Commissioner John Yates, have been probing claims that political donations were given in exchange for peerages. On Tuesday, it emerged that Scotland's First Minister Jack McConnell had been questioned by police from Scotland Yard in London last month. He was questioned about his nomination of Colin Boyd, the then Lord Advocate, for a peerage. Mr McConnell said he was "happy to help" the investigation but was "disappointed" that what he saw as a "normal and straightforward nomination" had become caught up in the investigation.